IRVINE, Calif. – (Aug 14, 2013) –Toyota Material Handling, U.S.A., Inc.(TMHU), the supplier of the number one selling lift truck in North America, presented Toyota Forklifts of Atlanta with a brand new equipped service van and an award for implementing a global quality program at the Atlanta dealership. The program, the Aftersales Service Evaluation and Certification (ASEC) Program, implements process and operational standards to deliver quality and overall superior customer service. 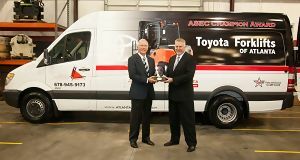 Lee Smith, dealer principal of Toyota Forklifts of Atlanta received the award and new service van at the dealership this week. The ASEC process is a global initiative to provide Toyota dealers with a blueprint derived from the world renowned Toyota Production System and use these tools and techniques to provide the highest quality service to customers and to continuously improve on it. The benefits of implementing ASEC at the dealership level are enhanced customer satisfaction and retention; improved departmental and dealership efficiency and effectiveness; a safer work environment and implementation of environmental standards based on Toyota’s ISO14001 Environmental Management System. It also can result in less downtime and lower operating costs for both the dealer and the customer receiving service. Toyota Forklifts of Atlanta has been providing the Atlanta, Ga. area superior products and service since 1973. The company’s focus on customer satisfaction has allowed it to grow to four full service locations including Lawrenceville, Lithia Springs, Scottdale and Augusta, Ga. Celebrating more than 45 years in business in North America, TMHU is the supplier of Toyota lift trucks, the number one selling brand since 2002. In addition to the full line of high-quality lift trucks, the company’s extended industrial equipment solutions include Automated Guided Vehicles and tow tractors. Toyota’s commitment to excellence in customer service extends throughout the U.S. and Canada. With more than 70 authorized Toyota Industrial Equipment dealers and more than 220 dealership locations throughout North America, Toyota dealers offer comprehensive customer service and support, including one stop shopping for both new and used lift trucks, rentals, parts and service, fleet servicing and financing. For more information on TMHU, please visit www.toyotaforklift.com/trees, www.facebook.com/ToyotaForklift or twitter.com/ToyotaForklift or call 1-800-226-0009.